I have two very hard-headed little boys. I knew that I wanted them to help around the house and have a way to learn a little responsibility, but I had to find a way to implement this. I tried sticker charts, check sheets, bribing, etc. I wasn't having any success. I also looked up chore charts on the Internet but wasn't finding what I thought would work for our family. Having said that, what I am using might not work for you, but I have learned through this process that trial and error is sometimes the only way to figure out what does work. I know that my oldest, Jackson, is a perfectionist and doesn't like when his brother, Brady, does something better than him. I made it into a little bit of a competition by making a chart that uses magnets to track what has been completed. Now, all I have to do is say, "Brady, you get to move your magnet for making your bed," and Jackson rushes to make his bed to move his also. I found the magnets at Walmart, which cost $1 an 8 pack. I also put the chore charts in plastic page protectors, because I learned that the magnets leave black marks on the paper. You could also laminate them. Jackson is in preK right now, and he has a really difficult time completing his morning routine before it's time to take him to school. I made sure to specify what needs to be done in the morning so that he can move his magnets when finished. They also have their evening routine, which includes picking up their toys and other items from around the house. I added a section for extra chores, but we don't complete all of them every day. A copy of the chart can be found here. How do you encourage your children to help around the house? Thankyou. 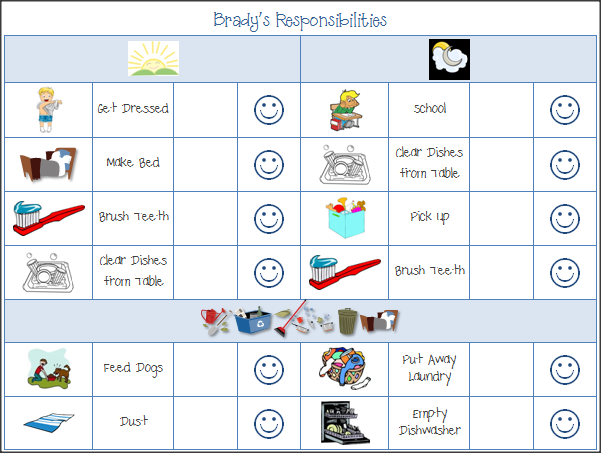 we are in the process of defining everyday routine and chores to earn money this has been a great help. 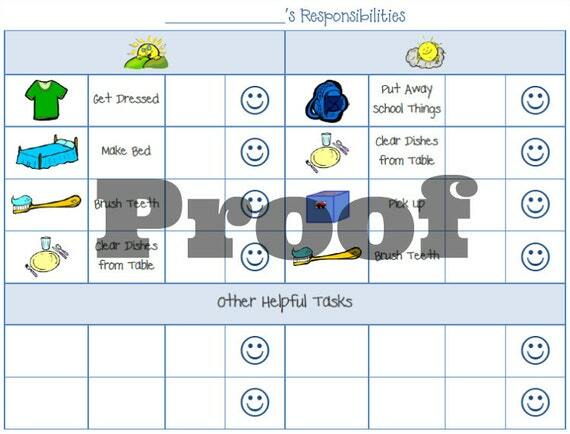 I've been looking all over the 'net for a good routine chart, and I love the simplicity of this one. Thank you!